All attributes set for the selected element are displayed by the table. By default, all possible attributes for the selected element, even those not set, are also displayed by the table. Attributes which have not been set are displayed in gray. Attributes which have been set are displayed in black. Attributes are listed sorted in alphabetical order. The names of required attributes are displayed using a bold font. The names of fixed attributes are displayed using an italic font. Click on the field at the right of the attribute name. This field is editable. Type the value of the attribute. If the attribute type is enumerated, this field is a menu rather than a text field, so you can directly choose the value of the attribute without having to type anything. Press Enter to commit the change. Right-click on the row of the attribute to be removed. Select the Remove item in the displayed popup menu. The "Force Removal" item is by default absent in the above popup menu. You need to explicitly enable it by checking "Enable the 'Edit|Force Deletion' menu item" in Options → Preferences, General|Features section. Clicking the down arrow button found at the right of the header of the attribute table displays a popup menu. This popup menu allows to toggle in the attribute table the visibility of attributes belonging to certain categories. 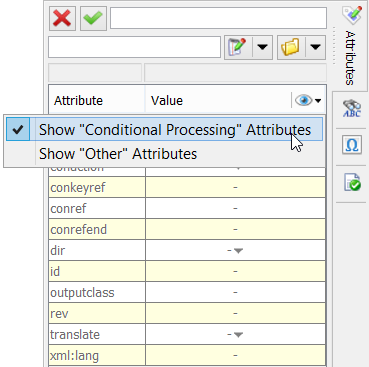 Simply uncheck a menu entry to hide in the attribute table all the attributes belonging to the corresponding category. All the XHTML configurations define an attribute category called "Scripting". This category contains attributes such as onclick, onload, onmouseenter, etc (up to 62 scripting attributes for XHTML5!). The "Scripting" category is hidden by default. DITA configurations define a "Conditional Processing" category (audience, platform, etc) and an "Other" category (xtrc, xtrf; hidden by default). DocBook configurations define a "Profiling" category (arch, condition, etc) , a "Scripting" category (onclick, ondblclick, etc; hidden by default) and an "Other" category (remap, xml:base, etc; hidden by default). Note that, even when attributes have been made hidden, it's still possible to specify them using the attribute form (auto-completion fully supported there) found above the attribute table. Also note that once an attribute has been specified for an element, it is displayed in the attribute table in all cases, no matter whether it belongs to a category marked as hidden. This can be configured, see Section 3.1.1, “Reducing the number of attributes displayed by the attribute table” below . See also the attributeVisility configuration element in XMLmind XML Editor - Configuration and Deployment.